A monitor arm is a great way to free up space on your desktop. The best adjustable monitor stand can handle that while alleviating issues brought on by uncomfortable angles. Neck strain is real, and just the tip of the iceberg as headaches and other maladies are usually not far behind. 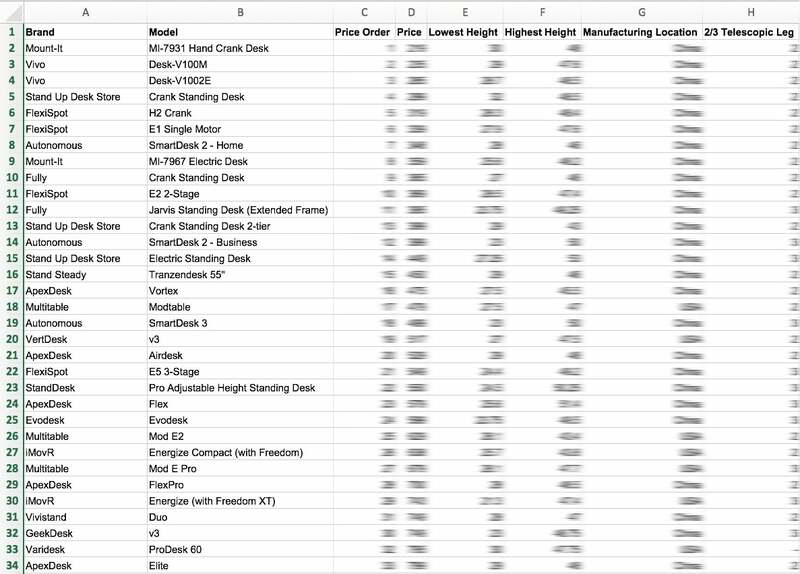 With that in mind, our team has compiled a list of the top monitor arms and a style for everyone. 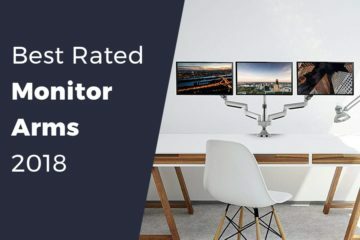 That includes consumers that simply want to clamp their monitor to their desk along with a people that need a streamlined solution that can handle multiple displays. Keep reading to discover the best monitors arms that we could find. While there are hundreds of adjustable monitor stands available, we broke things down into three specific areas with single, dual and multi stands that can handle three or more displays at once. If you’re still not sure what you need from a monitor stand, be sure to give our buying guide a look before diving in. Looking for a single monitor stand that won’t put a dent in your bank account? If so, we have the perfect solution for you with this mount from North Bayou. While it’s not fancy, it’s durable with an arm that can swivel and twist to suit your needs. North Bayou kept things basic with this single mount arm, but that isn’t a bad thing unless you like bells & whistles. It’s well-built but larger than other single mounts in this class and capable of handling flat screen monitors between 17 and 27-inches. It’s also VESA compatible with the standard 75mm to 100mm pattern. It’s simple to mount almost any monitor with this setup, and most users found it quite stable once the C-clamp firmly is locked into place. The gas spring system allows you to smoothly set the angle in an instant whether you need to tilt forward or rotate your monitor for landscape or portrait modes. The range of motion is 35-degrees up, 50-degrees down with a 360-swivel for rotation. That’s certainly respectable even if this ergonomic arm is a little underwhelming in a few areas. The biggest drawback with this arm is the weight limit as it only holds monitors that weigh up to 14.3 pounds although the white variant can handle five more pounds and larger monitors. While there are plenty of monitors that fall into that category, 14 pounds could be pushing it in the 27-inch range. 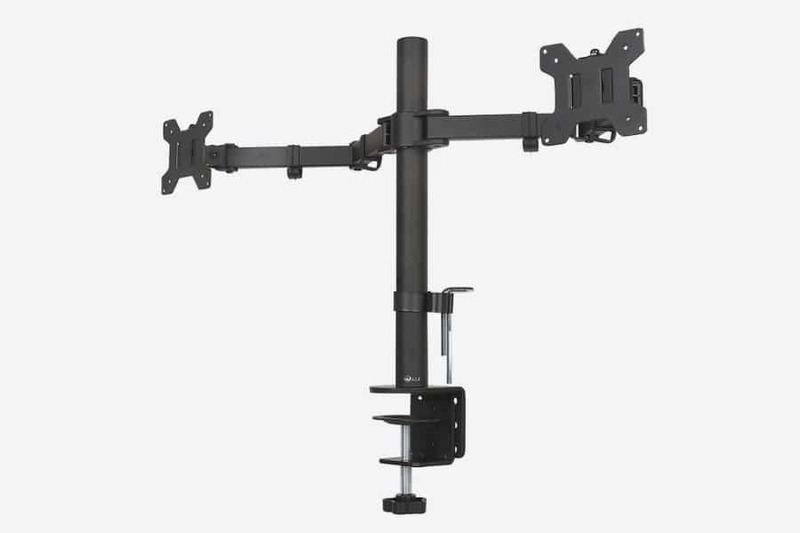 Aside from that, it’s a fine option and one of the more affordable single arm mounts we’ve come across. We’re not exactly sure when Amazon began producing their own line of products, but they make a little bit of everything these days… including monitor arms. This one comes from the popular Basics line, and we feel it’s the best monitor arm for consumers in need of a single arm setup. The highlights of this monitor mount for us would be the weight limit and size range. It’s VESA compatible from 75 x 75mm to 100 x 100mm like most mounts, but the lift engine arm mount can deal with larger monitors up to 32-inches in size. The weight limit is 25 pounds, which should cover almost all most modern flat panels available today. When it comes to ergonomics, Amazon’s stand gives you plenty of tilt with 70-degrees back and 5-degrees forward. Landscape mode is an option as well, and the clamp should cover most folks with a range of 0.4 to 2.4-inches. There are no USB outlets, but cable management should be sufficient in the arm as long as you’re not cable crazy. This ergonomic arm delivers when in the strain reduction department, and I can attest to the fact it pays to have a stand that can handle a lot of weight. When you upgrade your monitor, you shouldn’t have to buy a new arm unless you go with a dual monitor system or beyond 32-inches. While we opted to include the single monitor arm in our list, Amazon also has a dual monitor and wall mount available along with bundles that include a standing desk. Our first two options were traditional monitor arm mounts, but we’re going to go a different route for our third single arm stand. This diminutive little table mount will make any monitor ergonomic and has an interesting form factor to boot. At first glance, the Neo-Flex doesn’t look that ergonomic and seems out of place compared to other desktop stands. It’s simple to install as well, and we think you’ll be surprised by how agile it is despite its design. 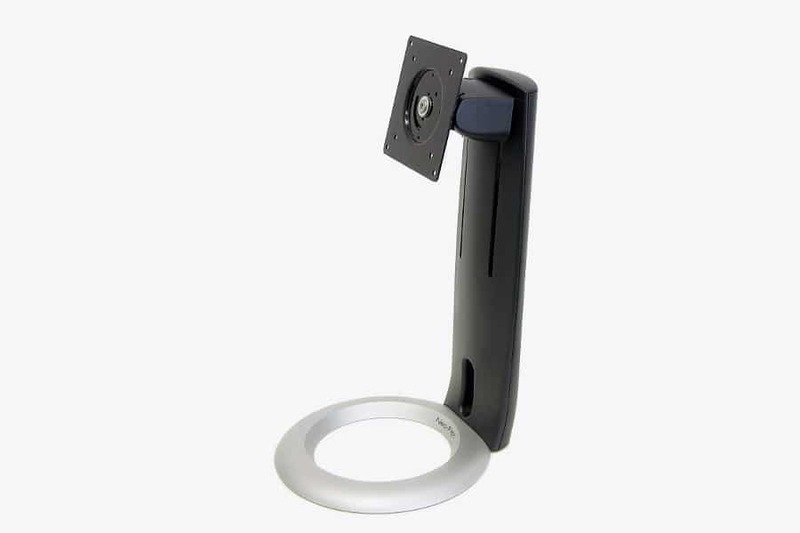 The VESA complaint stand has a 5-inch lift and features 360-degree rotation if you need to use landscape mode. Work side by side with others? If so, you’ll appreciate the pan feature which gives you 270-degrees of tilt left to right. Unfortunately, the other direction is a bit limited as you can only go 25-degrees upwards or 5-degrees downward. That’s not a deal breaker, but something to keep in mind if you need more freedom from your desktop. 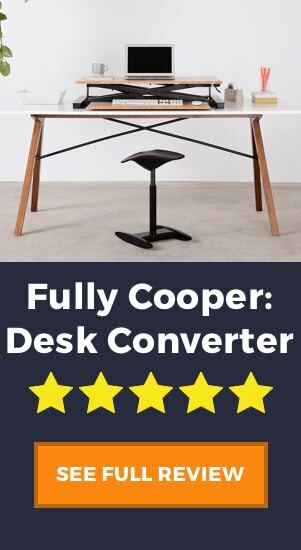 This stand is ideal when you don’t want a clamp-based system mounted to your desk. We also like the clean cable routing, just remember to check the weight and size of your monitor beforehand. The Neo-Flex is in the lightweight class as it can only manage 16 pound monitors up to 24-inches in diameter. We may be a few decades away from holographic displays, but the Ergotron LX will bring a futuristic style to your desktop nonetheless. This dual monitor arm can swivel and twist into any configuration and is the sleekest stand by a longshot. 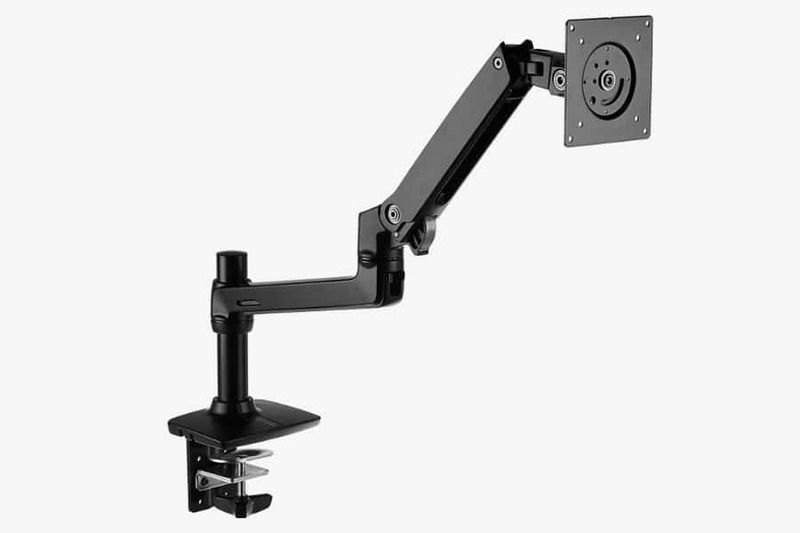 The Ergotron LX Dual Stacking Arm is made from polished aluminum and built to last. It passed the company’s 10,000 cycle motion test and sports a 10-year warranty out of the box. That’s something you won’t get from another dual monitor stand. Have a heavy set of panels? Well, this stand can hold a considerable amount of weight as it’s rated from 14 to 40 pounds (total) and is VESA MIS-D compliant. Screens up to 24-inches are no problem, and you’ll be thrilled to know this one can tilt and pan in 360-degrees. That’s another major perk of this arm along with the 75-degree tilt and 13-inch lift. While we love the design and tech specs on the ergonomic LX Dual, this one does have a few minor faults. The price point is likely to give you sticker shock, and while the cable management system is reliable, you’ll need to account for slack given its overall range of motion. If our top choice for the best dual monitor arm is beyond your budget, VIVO has a stand everyone can afford. The VIVO Dual Monitor Desk Mount is far from fancy but performs as advertised while handling larger monitors with ease. There are times in life when less is more, and sometimes you just need something that’s simple to use and install. VIVO realized that when they designed this stand, which has six top joints and 180-degree articulation. It’s certainly in the ergonomic class and will help combat strain and fatigue in the usual areas whether you are at the office or gaming long into the night. Another perk of this mount is the C-clamp. At 4-inches, it’s heavy-duty with an ample amount of padding to protect your desk. It has to be considering the mount holds screens up to 27-inches in size that are 22 pounds each. That’s impressive and ideal when you need a side-by-side stand for two massive flat panel displays. The range of motion isn’t as wide on this stand as you’ll find on others, but we feel the price tag more than makes up for that. If you have a taller desk or just detest clamps, you’ll be pleased with the variants of this stand as well. No, you’re not doing a double take. The WALI Universal Dual LCD Mount could be VIVO’s twin as they have a similar style and specifications. They are not identical twins, however, due to the array of variants and one very handy add-on. WALI’s desk mount is another model with a basic design but geared towards consumers with larger monitors. It has the standard VESA setup for each side, and you can adjust each plate by 0.8” for a perfect alignment. You can also tighten each joint independently with the included Hex keys which are stored in a holder on the base of the pole. 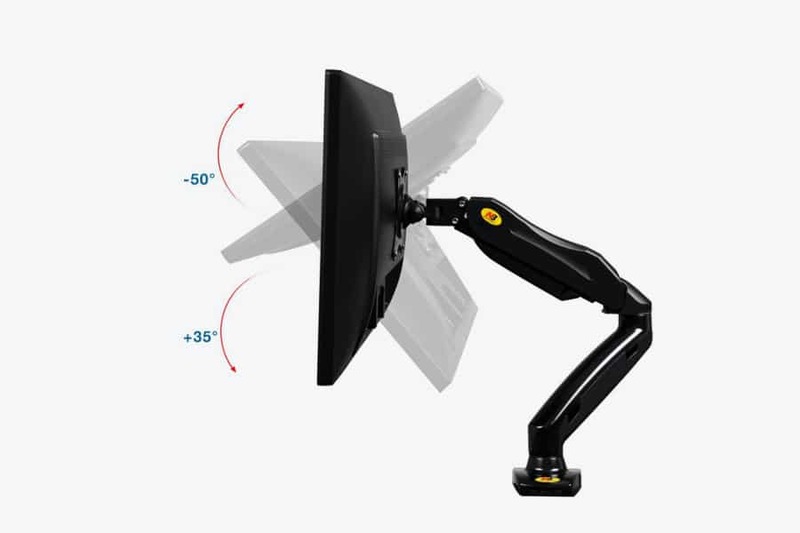 Each arm is capable of holding a 22-pound monitor and provides you with 180-degree tilt and 360-degree rotation. The tilt goes 90-degrees in both directions, and we love the demountable VESA plates which make installation a breeze. Have an older monitor that isn’t VESA complaint? They have a special adapter made to work with the M002 stand as well. We found that most users were happy with the stability this stand provides, but the range of motion is limited, so you can’t stack your monitors. Some users also reported issues with the VESA screw length although that will boil down to your style of the monitor in most cases. 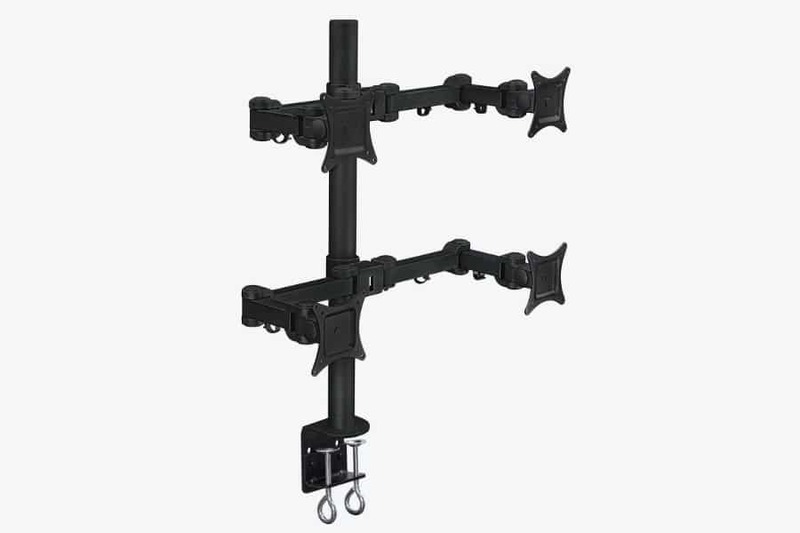 You can also opt for a gas arm version of this stand if you’re looking for a smoother system or the gas spring wall mount if you prefer drywall installation over the desktop method. It doesn’t matter if you program computer games or day trade stocks when you have multiple monitors you need something stable with a wide range of motion. There are plenty of options available, but this ergonomic multi monitor stand TechOrbits is the best adjustable monitor stand in our eyes. From the SmartSwivel self-balancing arms to the modern design, there’s a lot to like about this Three Monitor Stand from TechOrbits. The floating arm mounts use a gas spring system which allows you to rotate, twist and turn until you find the perfect angle. 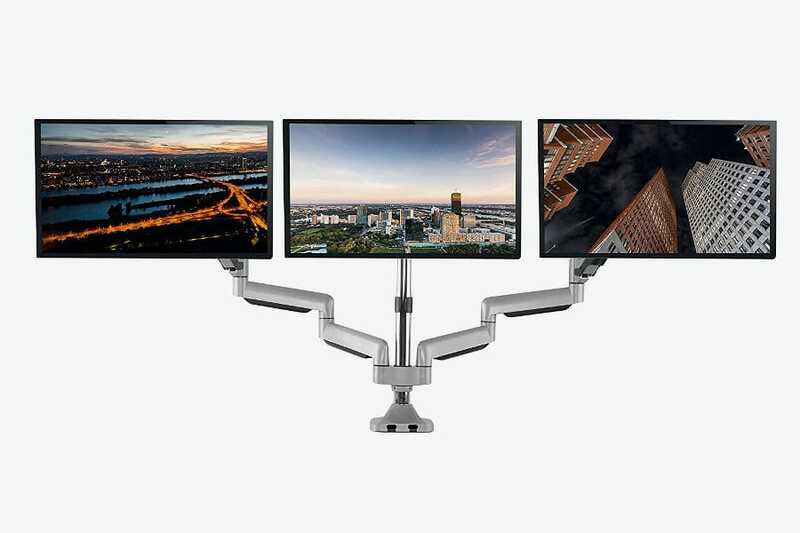 Those “smart” arms are built from high-grade aluminum with the ability to deal with monitors from a mere 13-inch display all the way up to a 30-inch panel. That’s a higher capacity than other models, and we can say the same for the weight. Each arm maxes out at 20 pounds, which is well above the average. Aside from the weight limit, the TechOrbits monitor mount is one of our favorites and one of a handful of stands I used personally before switching to a laptop full time. I was impressed by how stable it was regardless of the configuration or angle, and it’s going to look great mounted to your desktop. It comes with a 3-year warranty and is available in single and dual configurations as well. 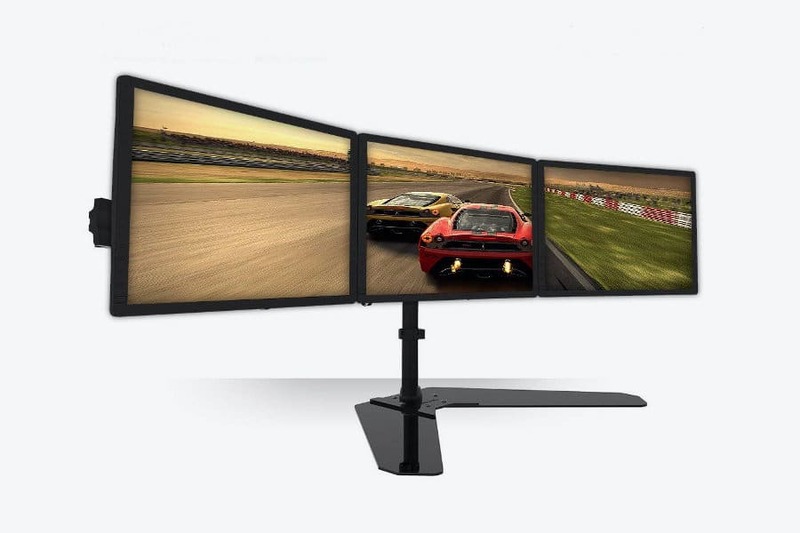 If you believe there is no such thing as too many monitors, we may have found the perfect mount for your desk. The minds from Mount-It! 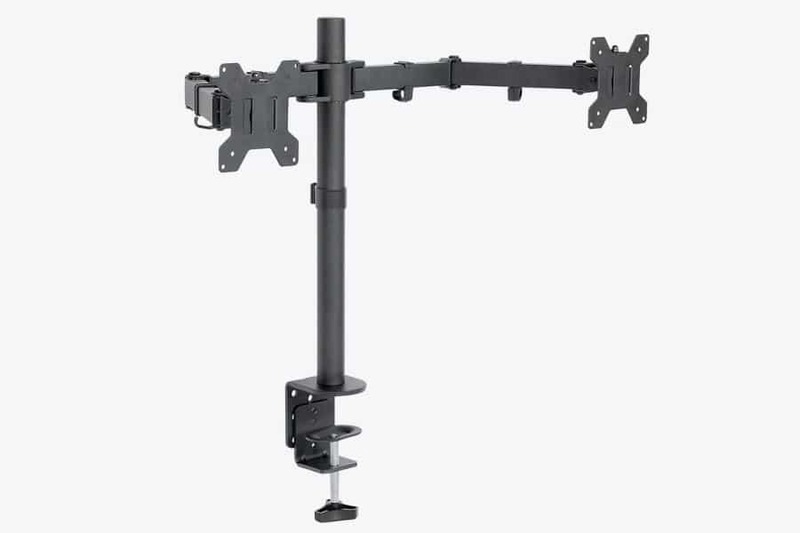 are responsible for this ergonomic VESA monitor mount which can hold large loads up to 88 pounds. The Mount-It! MI-754 is a quad mount system built from aluminum and cold rolled steel. 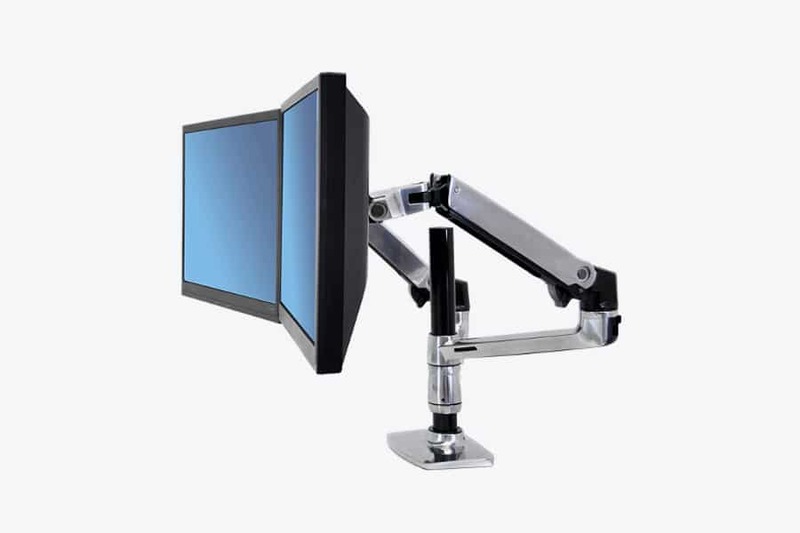 It has four arms, each capable of holding one monitor between 20 to 27-inches. You’ve got a “total” weight limit of 88 pounds to work with which shakes out to around 22 pounds per monitor. That should be enough for most consumers as 27-inch panels usually weigh between 10 to 15 pounds. Those arms are articulate sporting three pivot points that rotate 180-degrees. That range applies to the VESA mounts as well which are standard like the rest of our picks. The tilt angle is set to 90-degrees up or down, and it attaches to your desk with a C-clamp. It can handle a lip around 4-inches but isn’t necessarily the sturdiest system we’ve seen. We also want to mention the cable management system on this mount. It uses small series of wire clips beneath each arm to keep your cables out of the way and untangled. You will want to keep placement in mind however as the height adjustment is in the rear and may be difficult to access in some cases. The company also has a hex multi-stand if you really want to take things to the next level. Traditional triple monitor stands are among the most popular styles as they usually don’t take up much space, and are perfect for side-by-side configurations. The Jestik Horizon looks a bit like a glorified computer screen stand at first glance, but its backside tells a different story. We’re going to start with the obvious on this one – the stand. 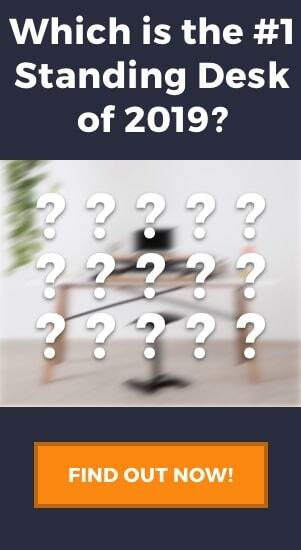 It’s large but weighted to ensure your monitors stay put… just prepare to lose some desk space. If you need to narrow that footprint, you can clip it to your desk with the included mount although the stand should be fine on deeper desks. Overall, it’s sturdy and quite capable considering it can handle three 27-inch monitors at 17.7 pounds each. On the back of the Jestik Horizon, you’ll find three VESA mounts set into an aluminum rail system along with a series of cable clips hooked onto the bottom of each section. It’s easy to find an ergonomic angle to suit your needs whether you require just a little bit of tilt or need to go from landscape into portrait mode. It can be a little tricky to tune in out of the box depending on your monitor size but performs as advertised. One area we felt could be improved with this stand are the instructions. While it sounds like a small thing, it can dramatically increase the install time, and several users reported some difficulty in this area. That’s really the only weak point we could find with the Horizon unless you’re in need of something a bit more vertical. While there were a few styles we left out, the best adjustable monitor stand should allow anyone to work more comfortably from their desk. Our picks are all top notch in that regard, and if you’re in need of a new toy for your comfortable new work area, be sure to also check out our list of the best ergonomic keyboards. Carl is a freelance writer that specializes in technology and gaming along with researching and reviewing consumer goods. Being a writer, ergonomic health is of the utmost importance in Carl’s day-to-day life as well.